A doomed fort in Arapaho country manned by the dregs of the U.S. cavalry, with corrupt leadership, a rootless gunman and two beautiful Mexican women—it’s a Fort Zinderneuf situation (see Beau Geste, a 1939 French foreign legion movie, for the reference) transplanted to the U.S. frontier. Chuka (Rod Taylor) looks for Trent while scouting. In late 1876, the film starts with a panning shot of burnt-out Fort Clendennon, still smoldering in its ruins. A cavalry patrol is trying to figure out how it all happened. 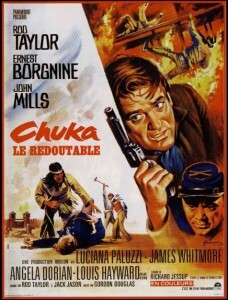 Cut to a single rider under the opening credits; it is Chuka (Rod Taylor). He rides into an Arapaho camp, speaking Arapaho with the young chief Hanu (Marco Lopez) and seeing that they’re burying some one who died of hunger. He leaves a hunk of jerky “for the children” and rides on, encountering a stage with a lost wheel and two female Mexican passengers, the older of whom recognizes Chuka (pronounced with a short “u” sound, as if it were spelled Chucka, supposedly because as a young man he spent a lot of time around a chuckwagon). She is Veronica Kleitz (Luciana Paluzzi), a wealthy young-ish Mexican widow who had a romantic history with Chuka and is traveling with her niece Helena Chavez (Victoria Ventri). As the men work on the stage, they are quietly surrounded by Arapahoes, who recognize Chuka and melt back into the dust storm without taking any action. The stage makes it into Fort Clendennon, where Col. Stuart Valois (John Mills) refuses to let them leave because a three-man patrol is overdue. Chuka tells him about the Arapahoes and suggests they leave the fort and its supplies to the Indians. Valois, an Englishman, is unwilling to do that and sends out chief scout Lou Trent (James Whitmore). His horse comes back, but Trent does not. Such order as there is, is maintained by Sgt. Otto Hahnsbach (Ernest Borgnine). At the fort: Sgt. Otto Hahnsbach (Ernest Borgnine), Col. Stuart Valois (John Mills) and chief scout Lou Trent (James Whitmore). [Spoilers follow.] At a formal dinner with his officers, Chuka and the women, a drunken Valois sneers at each of his officers in turn. Major Benson (Louis Hayward), second in command, is a cheating gambler who forces a captive Arapaho woman to sleep with him. The doctor was accused of cowardice, a lieutenant of treason. They were all formally acquitted, but their careers were blighted, and they ended up at Fort Clendennon. Valois drinks way too much, and he was cashiered from the British army for cowardice because of his drunkenness. The dinner ends when the doctor is shot through the open window with an arrow apparently intended for Valois. Chuka gets the two Arapahoes who shot it. Chuka agrees to go on a scouting expedition for $200. He kills four Aparahoes, rescues Trent and sees the missing three-man patrol dead. Back in the fort, a mutiny is brewing, with a plan to replace Valois with Major Benson and get out of Fort Clendennon. It is becoming increasingly obvious that it’s too late to get out. It is revealed that Valois, as a captain in the British army, covered for a Hahnsbach mistake in the Sudan and was captured, tortured and emasculated by natives as a result. That’s presumably why he drinks so heavily. As a young hand on her father’s ranch, Chuka and Veronica fell in love; he was banished, and she married a man selected by her father from her own class. Chuka (Rod Taylor) and Helena Chavez (Victoria Ventri) prepare for the end. The Arapahoes attack, and one by one Fort Clendennon’s defenders fall. 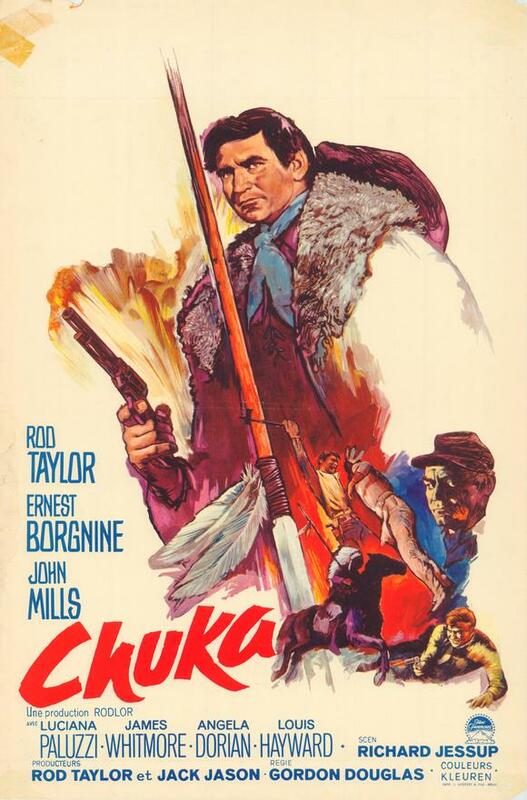 Chuka takes a spear to the side; Victoria an arrow to the back. As the Indians enter the fort led by Hanu, Chuka is defending Helena under a stairway. The Indians take the supplies they want, and Hanu looks at Chuka and leaves. When the cavalry patrol finds the burnt-out fort, Chuka’s gun is left, along with a small grave near the stairway. No bodies of Chuka and Helena are found, and the implication is that they got away. Australian actor Rod Taylor was a big star in the 1960s (The Birds, The Time Machine, The Glass-Bottom Boat), and this was a bit of a vanity project for him. He was the co-producer. Taylor plays Chuka in a heavy-handed way, and John Mills was a good actor but doesn’t seem to be paying a lot of attention here. This wasn’t a box office success, and it was Taylor’s only producing credit. The director was journeyman Gordon Douglas, who had made a number of westerns (The Nevadan, The Iron Mistress, Fort Dobbs, Rio Conchos, Yellowstone Kelly, Barquero), several of which were good. The screenplay was written by Richard Jessup, based on his 1961 novel. The music, by Leith Stevens, has a very late-1960s feel to it. At 105 minutes, the film is watchable but not as good as it could have been. Beau Geste did it significantly better. It is not entirely clear where the doomed Fort Clendennon is supposed to be. There were two branches of the Arapahoes, Northern and Southern. 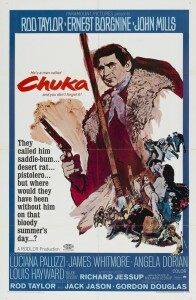 Chuka is said to be riding to Montana, but there are suggestions that Mexico is much closer. The two women are from Mexico as well. The southern Arapahoes ranged from southern Colorado, Oklahoma, northern Texas and perhaps occasionally into northern New Mexico. This looks like perhaps Arizona, so maybe, to the extent it is concerned about actual historicity at all, it takes place in New Mexico. Unlike in most cavalry movies, these Indians also attack at night. 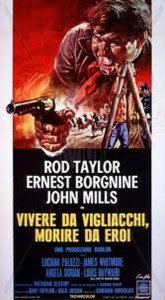 This was another of those 1960s westerns with a seemingly-misplaced European actress as the romantic interest (see, for example, Senta Berger in Major Dundee, Claudia Cardinale in The Professionals, Bibi Andersson in Duel at Diablo, Bridget Bardot in Shalako, and Camilla Sparv in McKenna’s Gold, not to mention any number of spaghetti westerns). Italian actress Luciana Paluzzi is not particularly memorable here as Chuka’s former lover, nor does she seem particularly Mexican. 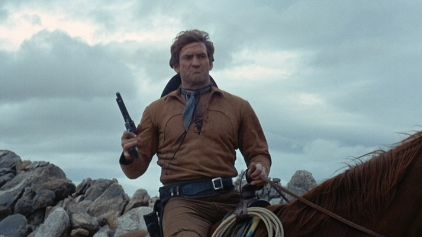 For Rod Taylor in other westerns as his career was fading, see the not-terribly-memorable John Wayne vehicle The Train Robbers (1973) and the even less memorable The Deadly Trackers (1973). 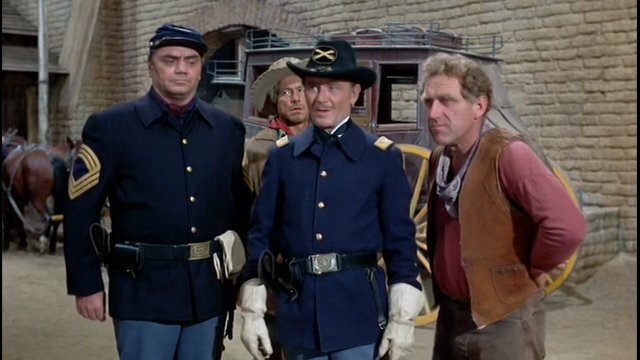 For a better doomed-fort cavalry western, see Two Flags West (1950). 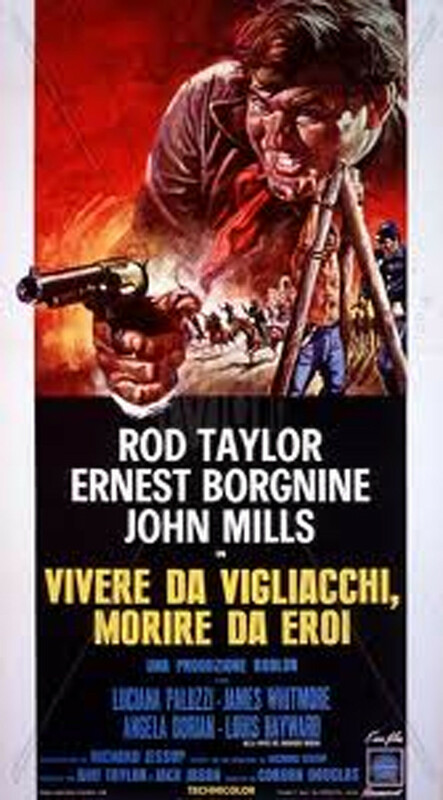 This entry was posted in Westerns Worth Watching and tagged Cavalry Westerns, Ernest Borgnine on March 12, 2015 by Nicholas Chennault.